This title, from Oceanhouse Media, is Dr. Seuss's first book, published in print in 1937. It follows the imaginative story of a boy named Marco, describing the comings and goings of some very interesting characters on his street. Marco's dad always asks his son what he sees on his way to school, but when the boy tells fanciful tales he is admonished not to tell lies. Dr. Seuss, always a lover of make-believe, shows off his own whimsical storytelling with a subtle message reminding adults to be careful not to crush a child's imagination. For the read-a-long effect, each word is highlighted as it is narrated. Tap on any word to hear it spoken, even in the 'read-it-myself' mode. Most of the Dr. Seuss books are great for children learning to read because they are filled with simple words and while this title goes beyond 'sight' words it should be an enjoyable read for kids 6 and up. For younger kids (and adults who would rather listen instead of getting tongue tied), narration is a great option. Although each page is essentially a still image, many pages begin by panning over Seuss' classic original artwork, zooming in and out to show off each segment of text, a nice semi-animated style. There is also a bit of very light animation in this title on several pages that show colorful confetti floating in the air. Most of the items pictured in the story also react to a light tap. 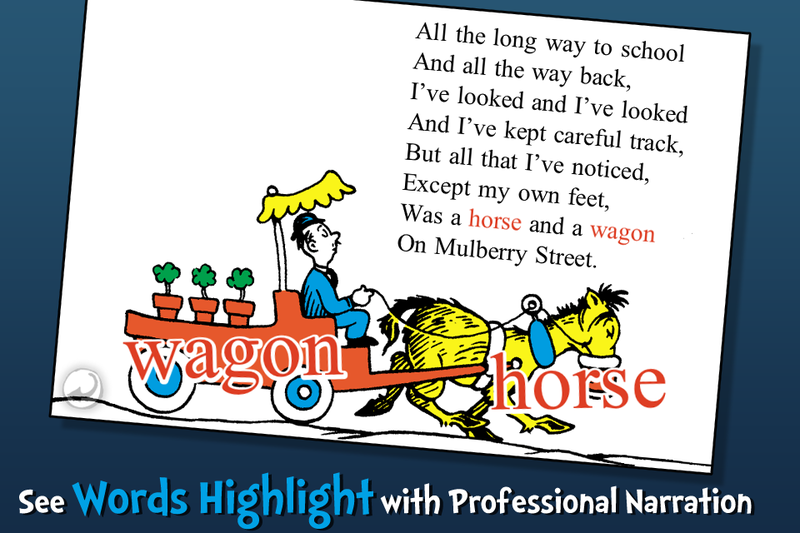 A visual image of the word with accompanying audio appears (for example, tap on the illustration of a wagon and the word "wagon" appears with audio saying “wagon”). If the word is also present in the text, it highlights there as well, providing lots of visual reinforcement for young readers. Overall this is a wonderful story app, lacking only a page guide to make navigation easier. If you love Dr. Seuss, there are lots of digital titles available as apps in almost any format. This book is also a great length for bedtime reading. No Seuss lover will want to miss this first book, making a digital collection feel much more complete. And if you have a child with a wild imagination, like mine does, you can even begin a nice discussion after reading this title about make-believe and reality. Highly recommended! "And to Think That I Saw It on Mulberry Street is a book written and illustrated by Dr. Seuss and Robert Carington, first published in 1937. It was Seuss's first children's book, originally titled "A Story That No One Can Beat," the manuscript was rejected by over 43 publishing companies (precise numbers vary, even from Seuss himself, who counted 27 and 28) but was eventually published byVanguard Press. Seuss has stated that he nearly burned the manuscript before its publication after being rejected by so many publishers. The story follows a boy named Marco, who describes the sights and sounds of imaginary people and vehicles traveling along Mulberry Street in an elaborate fantasy story he dreams up to tell to his father at the end of his walk, but decides instead to simply tell him what he actually saw. Dr. Seuss wrote the story as a commentary about how he felt adults stifled children's imaginations. Mulberry Street is the name of a street ( 42.102224°N 72.578119°W) in Springfield, Massachusetts, only one mile southwest of Dr. Seuss's boyhood home on Fairfield Street, and inspired both the book's story and name."